Imagine a completely conventional-looking piano recital program (Chopin, Schubert, Prokofiev), one where you know every piece well, maybe had even had a fling with one or two of the less-difficult ones—and yet from the opening notes the presentation sounded so probing and nuanced, the voicing so originally textured and sometimes unexpectedly deemphatic, the thoughtfulness so arresting, that you were seemingly hearing the works for the first time. It was the damndest experience. Zhang plays with poise and aplomb, yet always peering, listening to each line’s levels and inflections, calmly adjusting. That might make his work sound forced or labored or overthought, but his artistry actually has none such, flowing naturally almost always. The Mazurka in A Minor Opus 17 no. 4, with its indirect, backing-in beginning, floated over an unsure beat (unsure in the good sense), washed in a haze weirdly presaging Debussy: an extraordinary start and a partial tipoff to what lay ahead. The chords in Opus 24 no. 2, in C Major, could maybe have stood a pinch of militarism. A seatmate asked if Opus 59 no. 3 was macho enough, but I was in my own daze from the preceding no. 2, trying to figure out exactly what was so enthralling. While Schubert’s four D935 Impromptus are not everywhere wistful, Zhang was hypnotic throughout, permuting the phrases that we morosely half-heard just a moment ago, or long ago. Of the first Impromptu, the F Minor, Schumann wrote that it was “conceived in an hour of suffering as though meditating on the past.” Heck, that applies to half of all Schubert. John Daverio more recently speaks of the “unmistakable imprint of pastness … uncanny … imbued with the quality of reminiscence.” The second and third Impromptus may have been simply too beautiful, filling Jordan Hall with a rare, almost distracting gorgeousness. Some complaint, huh. But in the A-Flat Major, brusqueness offered relief, and in the B-Flat Major drama arose amid the prancing. The last of the set, same key as the first, showed banging energy yet was still largely melody-free, even as it ended with vehemence. The Chopin and Prokofiev sonatas similarly were intense, focused, distilled. Zhang’s righthand throughout the Chopin may have been the quietest I’ve ever heard. The Grave—Doubletime rose and fell in waves, the Scherzo cohered disconcertingly, the Funeral March sang, and the Finale’s graveyard wind blew in a flurry of light anxiety. The Prokofiev Sonata No. 7’s Allegro Inquieto seemed to pay clearer attention to the notes than we had consistently heard from the pianist. The Andante Caloroso sang with deep warmth. The famously precipitous closing toccata was almost too fast, perhaps the most immense reading ever, splintering the air and kicking Stalin’s bones from afar. I am sure the hall needed overnight to calm down. One was surprised to see Zhang able to button his coat as he bowed to roars. A reporter should note drawbacks. Sometimes a given piece simply has to show more profile. A few times Zhang did not eschew melody so much as bury it deliberately, at least from where I sat. There were excess pedal and, twice or thrice, rubato. Also a little rushing and slowdown: it was never the emergency rubato followed by automatic catchup that weaker pianists require, not with Zhang’s jawdropping technique, just from being in a bit of hurry at that spot. Nevertheless. If you’re a Rembrandt viewer who revels in also examining the details within his browns and the shades of black, beside the creamy lighting of main points, do not fail to hear Hoachen Zhang next time. 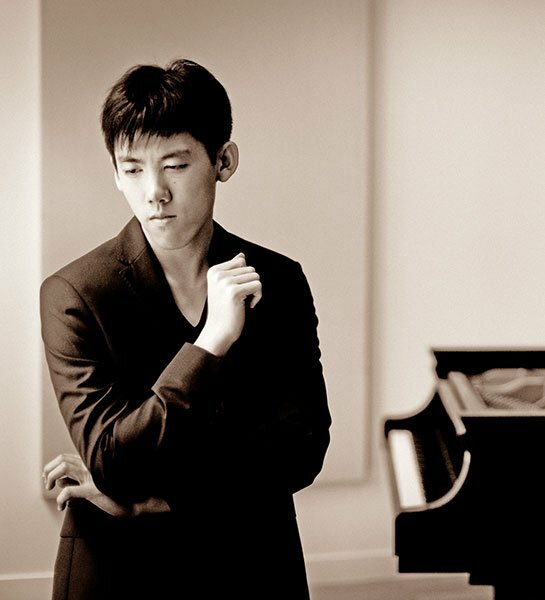 To judge from the penetrating local reviews six years ago by Caldwell Titcomb and Matthew Guerrieri and the 2009 Van Cliburn competition CD the year before, Zhang has been formulating for some time his interested-in-all-lines approach. I pondered things I’ve never cared to ponder before with a young pianist, such as, “What will the next six decades or so hold for him interpretatively?” On Saturday night, all of his artistry sounded somehow better, more engrossing and less didactic, than the similar nifty equal voicing and inner-line exposures from Russell Sherman long ago and then (say) Andrew Rangell the decade after. Their spotlighting pointed from a penlight: check out this subtle canon you never heard before. I like that sort of thing plenty, but Zhang’s was more thorough and hence more interesting. The first encore was pure Cirque du Soleil—Arcadi Volodos’s Turkish March (Mozart) transcription. His hands a blur, Zhang played it altogether as well as and a bit faster than Volodos, and, for those keeping score, notably better than either Lang Lang and Yuja Wang. By the end (talk about splintering) it was not unlike the Donald-Daffy Liszt duel in Roger Rabbit, and thus should become a competition mandatory, I say. The second encore was the profoundly aching Brahms Intermezzo Opus 18 no. 2 in a rendition that, for my mood, was just too perfect and pretty, after all that had gone before. Lightyears from the oh-so-tender rendering of Chopin’s Op. 17 no. 4 Mazurka that opened the program, Zhang’s assault on the Prokofiev Seventh Sonata was sharp, brutal, warlike—desolate yet still lyrical. We were already pretty much blown away by the power and tonal richness of the Chopin B-Flat Minor Sonata that preceded it, but Zhang’s weaponry in the Prokofiev leaped forward a century. There was more elasticity in the first two movements than previously on record (plasticity being a 20th-century invention, no?). The breakneck speed of the vicious but giddy finale was a risk that paid off. We were battered but not bruised. The slow movement was too elastic and would have had more force if it had been in stricter tempo. Rubato diminished power. And the tempo of the Finale was just too fast for him to control the very end, where he had to overpedal. But then who could possibly play it that fast with the articulation required. These are such minor criticisms. I loved the wildness of the last Schubert Impromptu. In Brahms’s Op. 118 no. 2 Intermezzo encore, there he kept such a classic tempo, no rubato. That was a good lesson for me: just right, especially after that program. Bravo! Anyway, if you are the sort of consumer who tracks the most promising under-30 superhuman keyboard entrants, now include Zhang’s name alongside Albright, Buniatishvili, de la Salle, Grosvenor, Kholodenko, Levit, Li, Lisiecki, Trifonov, Tao, Wang, plus all those I’m unaware of. I will want to hear Haochen Zhang playing anything. Me too! Like the author of this insightful review, I was enthralled from the wondrous first measure of the A minor Mazurka. Throughout the recital, but especially in Zhang’s Chopin, my eyes just wouldn’t stay dry. One last note: the Brahms was indeed pretty and perfect – I imagine Mr. Moran’s mood not so different from my own – but the Intermezzo’s perfection was of Zhang’s inimitable kind, and my ears and heart quickly opened. Thanks much. One is not always sure about one’s take. I did hear from a bird that Zhang has studied also with ‘focused interiority’ master Meng-Chieh Liu — I had wondered as much during the recital — which partly explains the thrall.